We’re big fans of your Old Yeller that you so actively enjoy at the great events. We’ll keep it up if you keep bringing the car out. Thanks to you for sharing such a prized piece with the general public. You should attend the mid-July “Moonlight Cruise” in Wichita, Kansas. It’s wonderful. On the main street abutting “Old Town,” with its melange of good bars and restaurants, you’ll find about 5 blocks of door-to-door automotive everything, and the layout runs up several side streets on both sides for a block also. All the parking lots are also reserved for show cars and there are nice hotels and motels nearby, one right on the corner by Old Town, where I could look out my third-floor window and watch people wondering what my Morgan was–it’s Kansas, after all. Rat rods, customs, even Ferraris and Maseratis–they’re all there. There used to be a 40-mile loop run at midnight, but that seems to have faded into a parade through town. The fun part is that the police sort of disappear and most of the cars doing the cruise do burnouts in front of the hotel. ‘Tis a cultural event not to be missed! Even had some car friends from England attend in ’12 and they were impressed. If a man who has truly done it all says an event is wonderful, then it must be wonderful in our book as well. Looks like we have yet another event to add to the list. Thanks Toly! How can “Best Vintage Car Photos” include cars newer than 1930? What the heck is your definition of “Vintage Cars” ? For a variety of reasons, we subscribe to the broader usage of the word ‘Vintage’, as in an older car of distinction, not just the narrower definition of a 1919 to 1930-era car. Otherwise, we’d be using a few dozen terms for all those automotive sub-categories out there, and for some it might just be a headache. For what it’s worth, the same things said for ‘Vintage’ can also be said for ‘Antique’, yet we do think the definition of Brass Era cars is unique enough for usage. The truth is, cars are just getting older and the word vintage, defined by Merriam-Webster as “of old, recognized, and enduring interest, importance, or quality”, serves as a pretty good blanket term for these older cars and why we enjoy them. I like the “Best” photos of different categories but didn’t see a category for my car. I believe I have a contestant for “Most Unique Sports Car”. I have a Sports car that I have modified to start by direct injected compressed air into each combustion chamber in sequence. This is a aluminum 215 Olds engine. It also features a fully Cross Flow cooling system. Cross flow in the block and heads with 14 inlet ports and 4 exit or outlet ports using a remote mounted waterpump. My car has been referred to as a “Frankenstein” car because I used other car parts to build it including, Triumph, Jaguar, Chevy, GMC, Honda, Toyota, Ford, Olds, Ferrari, Mazda, Kubota tractor and I almost forgot, some MG parts too. Also countless aftermarket parts and hand made parts. Also some unidentified parts. I am in the process of making it street legal so I can drive it on the street, but right now when I start it up, it sets off car alarms in a ten mile radius. (At least that is what my neighbors say). Here is a photo of it. I have named it the “Green Dragon” but not for the reason one might think. I named it after the Green Dragon Tavern in Boston, MA. Where much of the plans were made to rebel against the Crown and form a new country. Even though most were British and loved their home country, but they didn’t like the way the Crown was treating them in their new land. 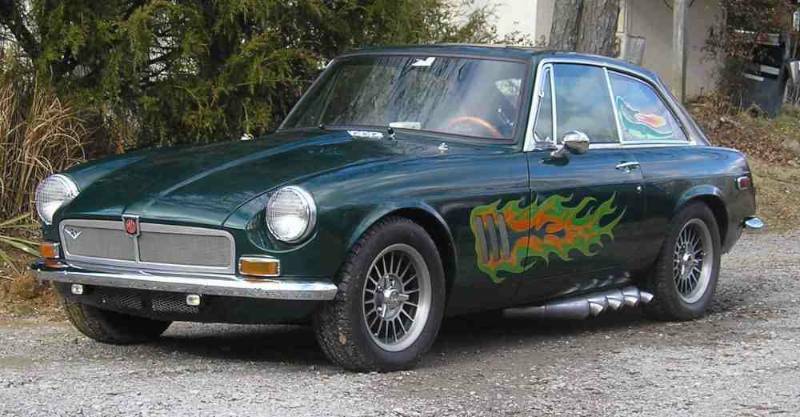 Howard, I think “curious” would be the best way to sum up our reaction to your very unique MGB GT. Best of luck registering it for the street (especially if you live in Massachusetts), and perhaps a profile on the car is in order. Having been in involved with SCCA/IMSA racing since the early 70s driving Porsche automobiles and being a true sports car nut I find the newsletter catering to the clowns that purchase their “speculative toys” at auction or following a silly concours and probably can’t even shift the thing. Coverage of obscene prices paid by idiots for their portfolio does not interest me. Awesome automobiles carried on covered trailers to a golf course so some minion can polish the inside of tires does not fit my idea of the true sports car. I built engines for my career, specializing in 4 cam Carreras in the 356 bodies and then competition 6 cylinders, including others as in a stray Jag or Italian creation occasionally. The sports car in competition, to me, is about sitting around a campfire in the paddock, talking about gear rations, or helping a competitor repair the missed shift damage. In short what used to be called a bunch of CAR NUTS. You’re simply perpetuating the deterioration of a once phenomenal hobby. The clown with a 25 car “collection” or accumulation of speculative objects is of no interest. I sold my last 4 cam 356 speedster, a number of years ago, to the west coast, and it ended up in Otis Chandler’s stable. So be it. Times have changed. Sorry to see you go. That said, we are in the business of reporting the facts from as many parts of the sports car world as possible. For better or worse, these auction prices are really happening and we simply can’t ignore them. 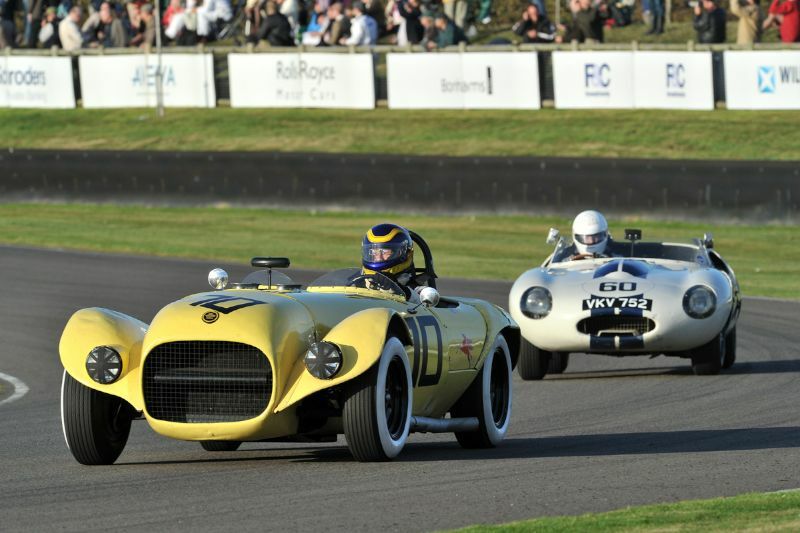 If our auction or event coverage isn’t your cup of tea, then we’d suggest you look at our extensive coverage of the vintage racing scene. “Letters to the Editor” allows you to write in with whatever is on your mind and share it with other Sports Car Digest readers. Whether it’s something specific about our content or just a general observation on the classic car world, we want to hear your opinion. If interested, email us at mail@sportscardigest.com. So Larry Skoglund thought Otis Chandler was a “clown”.Odd he sold his last Porsche to someone that put bread on his table.Did he sell that car to Chandler because he liked the guy or was it,as we say………………………..good money?